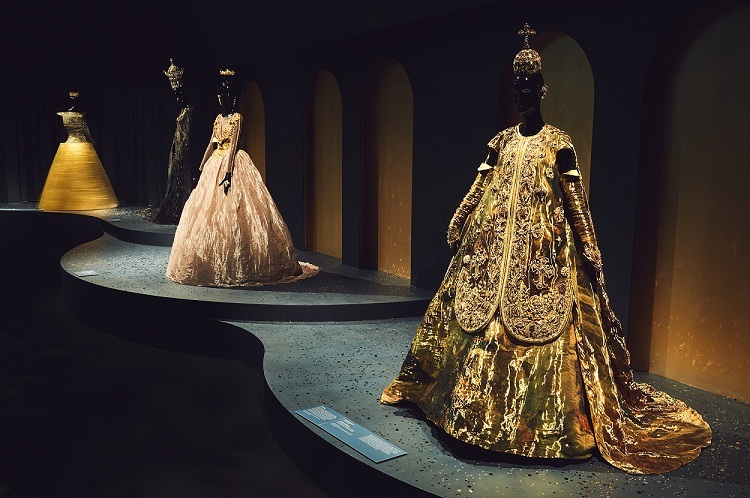 It’s been touted as the most ambitious event organised by the National Gallery of Victoria (NGV) and, what’s more, as one of the most exciting exhibitions ever to be mounted in Australia. If you have the good fortune of being in Melbourne any time before April 15 this year, you will find that the NGV is where it’s at. 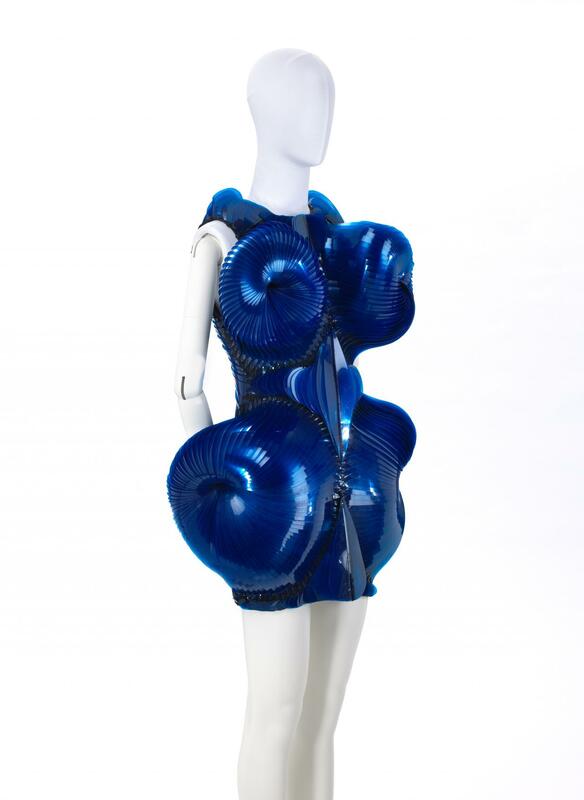 The Triennial easily lives up to this high praise; it’s neither pretentious nor purist. And not only is the (free) inaugural art and design show massive in scale, it is also incisive, fun and, frankly speaking, quite telling. It explores a myriad topics and subtexts — including questions of identity and the status quo, the inseparable yet uneasy bedfellows that are art and commerce, and the objectives of modernist design — through a number of thought-provoking narratives; with many choosing to focus on and interpret anew the ‘movement of people’ — a recurring leitmotif that runs through the exhibition. Featuring the works of over 100 artists and designers from 32 countries, the project traverses all four levels of Australia’s oldest and largest gallery. Pop in to see what the fuss is all about and we promise that you will leave the premises impressed — and possibly with a bunch of new additions to your phone gallery, for it rarely gets more Instagrammable than this…. A room full of skulls. A hundred, to be exact. Might sound disturbing but the Ron Mueck installation Mass (2016-’17) is actually oddly beautiful. Even heady. Stripping our species down to its bare bones, it spotlights the delicate artistry inherent in the design of the skull and, by extension, in all of creation. Of course, the skull has become a symbol of death and danger today. Visualise the most iconic comic book villains (Skeletor from He-Man and the Masters of the Universe, Batman’s friend-turned-foe Harvey Dent, Red Skull in Captain America, etc). Then there’s the Jolly Roger — the flag used to identify a pirate ship depicts a skull and crossbones. Think of the wrathful Indian goddess Kali even, the one who wears a garland of skulls, according to mythology. An image of a skull and crossbones has also over time and quite ubiquitously come to symbolise poison and toxicity. But the skull has found its place in lifestyle and culture as well. In fashion, it has morphed into a motif, gliding onto every piece of clothing you can think of, even achieving uncommon popularity when it comes to tattoos (you need only ask any old Harley-worshipping metalhead). 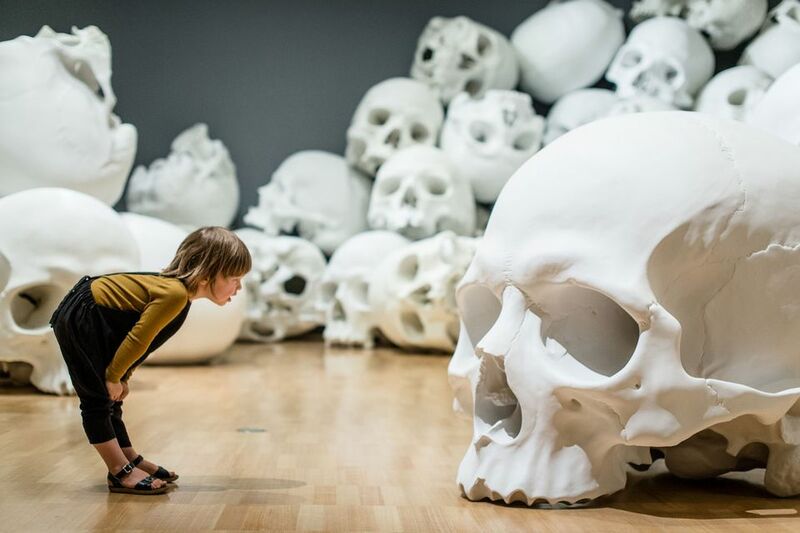 Often a muse for artists and designers (it’s safe to say that ‘pop scull-ture’ is here to stay), these oversized skulls, however, have Mueck mulling over neither style nor fictional characters, but something far more real: mortality. 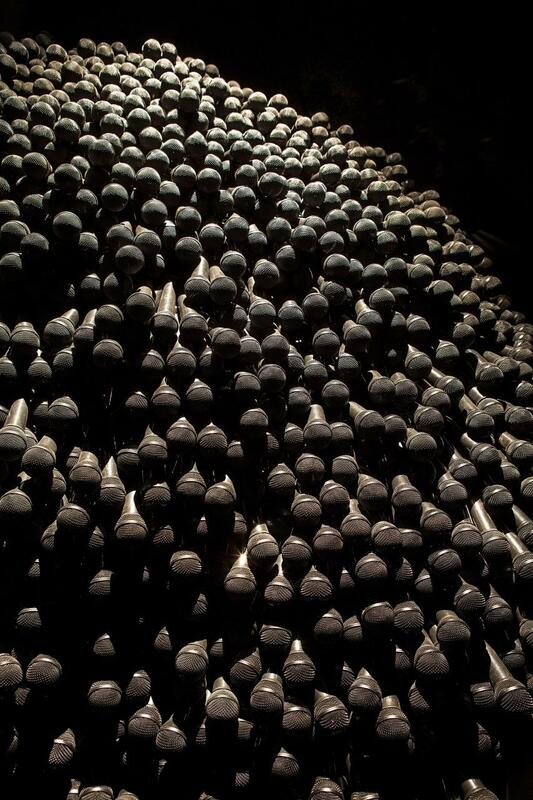 Giving us yet another reason to look into the depths of our souls, Australia’s most successful contemporary artist abroad wants his work to conjure up ‘iconic images of massed remains in the Paris catacombs as well as…contemporary human atrocities in…Cambodia, Rwanda, Srebrenica and Iraq’. And viewing it in his motherland makes another stark statement if you think about it. First-world countries like Australia (or, in a local context, even cities like Mumbai and Delhi) are often celebrated for their multiculturalism. It’s where those coming from a place of fewer opportunities migrate to, to ‘make a life’, realise their dream or carve an identity, thereby turning these hubs into champions of diversity. But migration at times is also born out of violent or forceful acts of displacement. For example, Australia is now home to a sizeable number of holocaust survivors and Cambodian refugees who had nowhere else to go. In either case, the fruits of multiculturalism can only be enjoyed if the ‘outsiders’ are allowed to integrate into the local scene. If not, far from behaving like a melting pot, it could alienate them and even fuel racism. Among artists who have, as a protest, renamed or changed works on display at the Triennial is Irish documentary photographer Richard Mosse. Incoming (2015-’16), which is evocative of an elaborate CCTV footage at first glance, comes alive on a multiscreen display. The black-and-white recordings give us an insider’s view of a refugee camp. Monitoring their every move, the cameras capture the condition of the incomers who are trapped in a Big Brother-esque setting reminiscent of Art Spiegelman’s Maus. This is achieved with the help of military-grade equipment used for border surveillance, which Mosse also used to make his Prix Pictet-winning photo series Heat Maps. While the artist does acknowledge the role of the Triennial and the NGV in raising awareness about the plight of refugees as well as for allowing him to create this particular work of art, he also directs attention to the gallery’s controversial (and recently terminated) contract with Wilson Security, an agency that has been accused of sexual assault and violence against refugees and asylum seekers during the time it was engaged to provide security services for the Australian government’s detention centres on Nauru and Manus Island. And to achieve this, Incoming features a powerful statement by Behrouz Boochani, a journalist, human rights activist, film-maker and Iranian refugee who is presently detained by the Australian government on Manus Island. 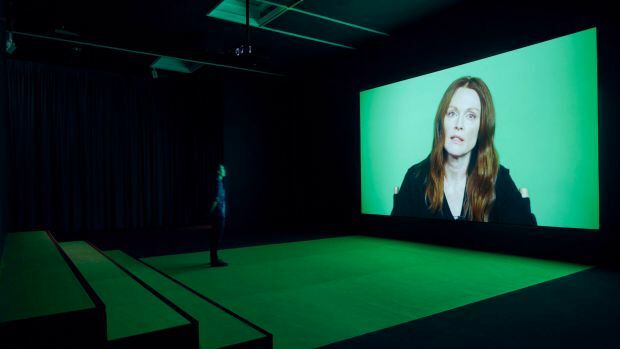 Another stellar video installation that has become quite the conversation starter happens to be South African artist Candice Breitz’s Love Story where Julianne Moore and Alec Baldwin narrate the life stories of six refugees. 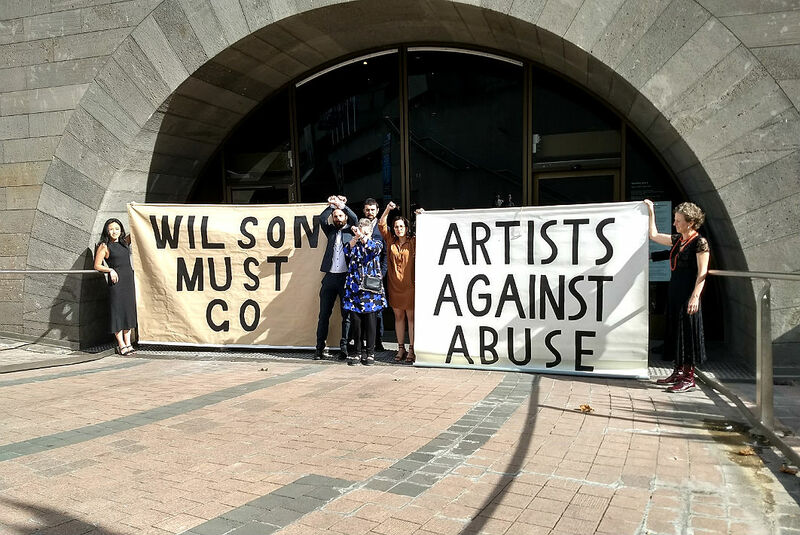 Just before the preview night, Breitz changed the name to Wilson Must Go, announcing on social media that ‘The new title will remain in effect for as long as the work is on view at the National Gallery of Victoria, or when the work is exhibited in any other exhibition context on Australian soil, until the NGV severs its relationship with Wilson Security’. Adding fuel to the fire were groups like Artists Committee and Abuse Against Artists who, in a show of support, blocked the main entrance of the gallery on the day of the by-invite-only event in mid-December. The former had an open letter signed by over 1,500 people. A cello performance of a song composed by Boochani delivered a strong punch. Posters that were distributed read: “We want to assure you that our protest is…directed at Wilson Security, the NGV governance and, by consequence, the state government. We feel that it has come to the point where we must place pressure on the NGV via their biggest supporters – their VIPs”. Words were not minced. And when Wilson Security lost that gig in less than three months, nobody was surprised. Buenos Aires–based artist and designer Alexandra Kehayoglou is known to shine the light on landscapes under threat. 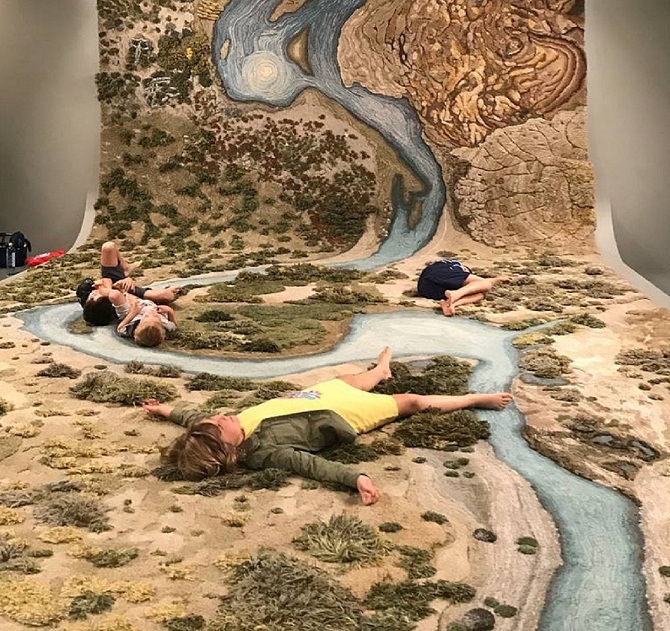 Her powerful works merge ‘traditional rug-making techniques with detailed site analysis, drone footage and photography’, says the NGV website, and this NGV-commissioned artwork is no different. Santa Cruz River (2016-’17) is a crowd favourite, and why not? After all, it is one of the interactive works on display. 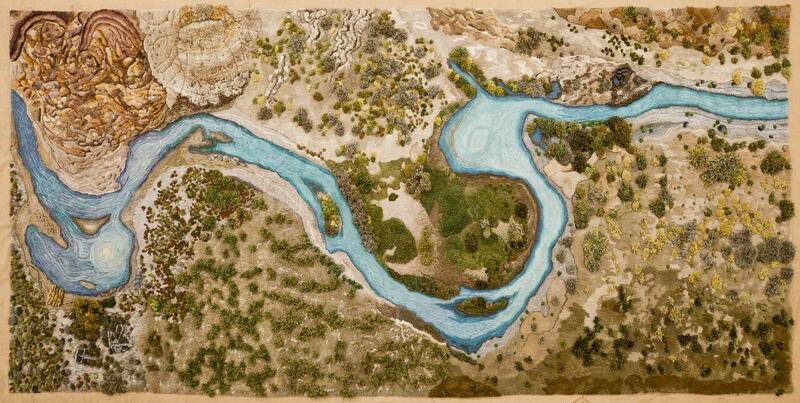 Coming back to Santa Cruz River, it punctuates my art walk with a nice little lie-down. The beautifully crafted carpet is quite inviting by the time you reach this artwork at the Triennial. The ‘bed’ depicting the site of two proposed hydroelectricity dams — an international collaboration between Argentina and China — on the Santa Cruz River in Argentina brought to my mind the map of Gaul in Asterix, a panel that starts off every one of the comic books. You blend in with the artwork — as long as you don’t mind some downtime with a bunch of strangers — and if truth be told, it does make for a rather arty #MirrorSelfie, thanks to the mirror that covers the ceiling as a part of this piece. So, while you stare at the ceiling/mirror and indulge your narcissistic side, do spare a moment to reflect on what international trade and the race for infrastructure development might mean for the natural ecosystem. Founded by 40-year-old Toshiyuki Inoko in 2001, teamLab has one leg in the present, and the other in the future. 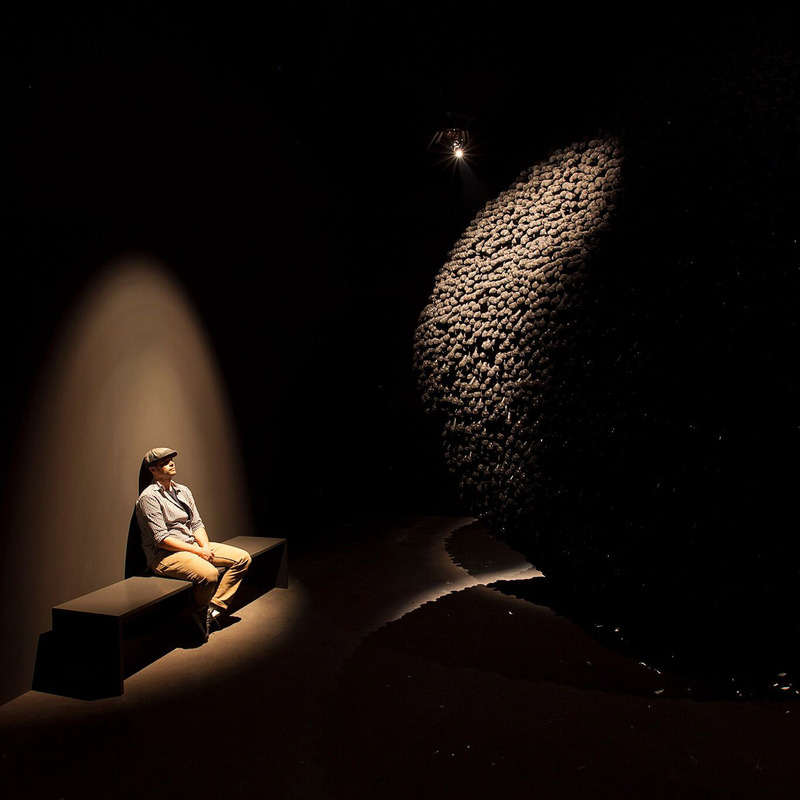 The Japanese art collective and interdisciplinary creative group with about 400 members has a very specific focus, which is geared entirely towards the intersection of interactivity and tech. 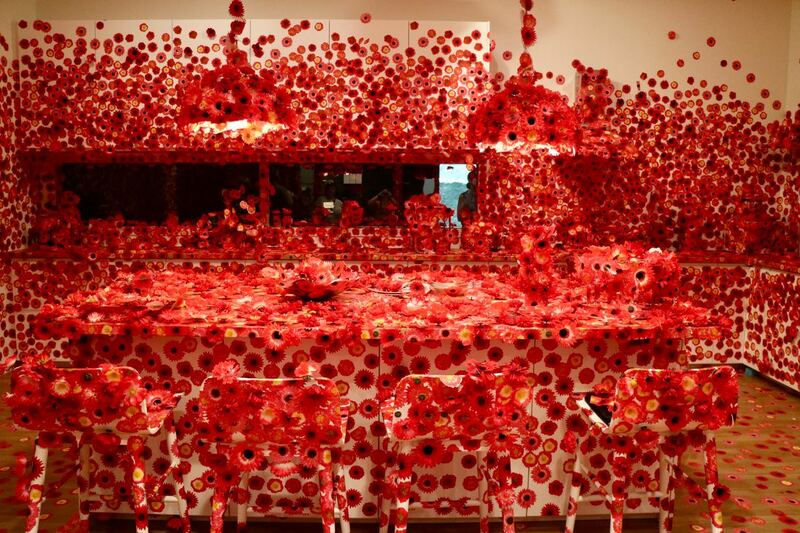 And it is no wonder at all that their groundbreaking digital installation at the NGV Triennial is easily my top pick. Interactive in the truest sense of the word, the installation actually feeds off the viewer. It’s almost as if the artwork is reacting to you, or participating in a conversation. 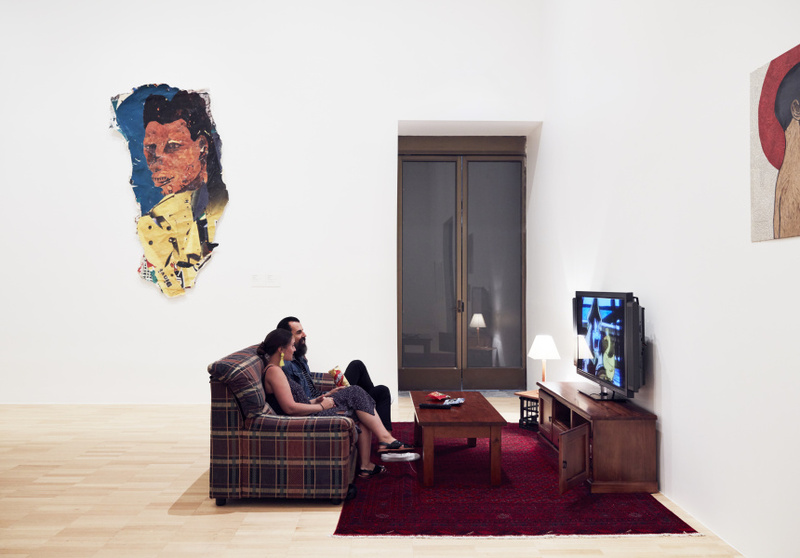 The installation is dynamic, changing according to the relationship you and the other viewers in the room form with it — one that is certainly based on give and take. It’s a simple and clever idea that revolves around monitoring movements and creating memorable moments in the process. When you enter the dark room, you can barely see anything. As your eyes adjust, you see swirling lines, like those in The Starry Night or Scream, except that the ones here are projected on the carpeted floor. And are in motion. The viewer’s movement is tracked by sensors. These are then communicated to the projectors, which create similar movements emulating yours. The faster you go, the stronger the vortex becomes. If a person is standing still or there’s no one present, no visual flow occurs, like a hibernating escalator that is programmed to conserve energy when not in use. It’s dizzyingly good and it’s easy to get immersed in it. Mirrors all around lend an illusion of a large space so you are surprised when you almost bump into the glass, and yourself. Vortices are a powerful force of nature and Moving creates vortices and vortices create movement, 2017, has become a force to reckon with — positioned as it is at the cutting edge of art and technology.